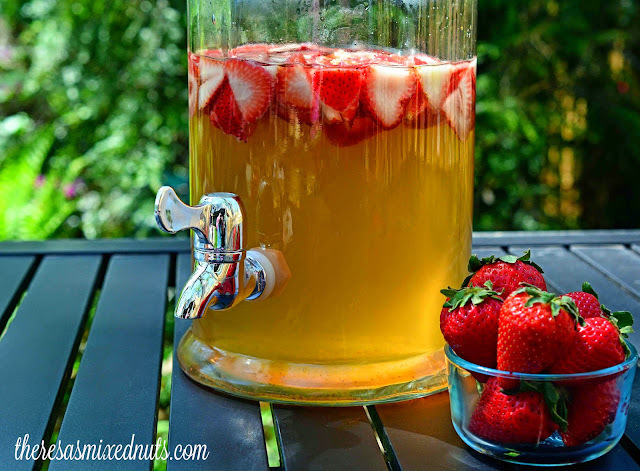 Theresa's Mixed Nuts: Strawberry Coolers Keep You Hydrated & Refreshed! Strawberry Coolers Keep You Hydrated & Refreshed! We have a lot of outdoor projects going on at our house. Jason has been going non-stop on rebuilding our deck, and I am in the middle of relocating some of our perennials, chopping down dying bushes, and getting a space ready for my summer tomatoes. As happy as I am about the weather finally heating up, when you are doing back-breaking work in the heat, it's so important to stay hydrated! Water is the best thirst quencher, but sometimes you want a little flavor to sip on. 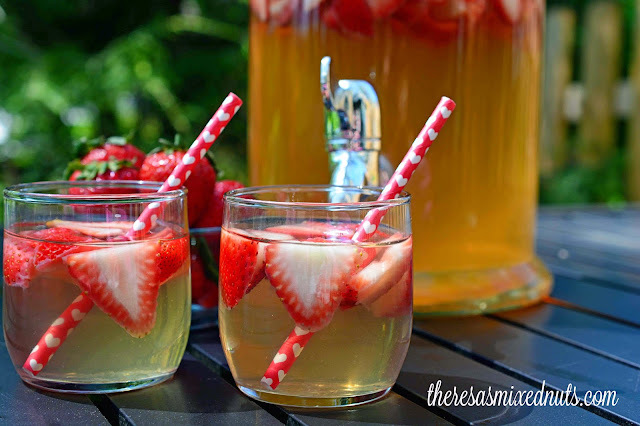 That's why I think this Strawberry Cooler recipe from Golden Blossom Honey is the perfect summertime refresher! A lot of flavored drinks are loaded with sugar, which makes me much more thirsty when doing outdoor work. I love that this recipe is sweetened with natural foods, like honey, strawberries and ginger root, so I get a sweet beverage that keeps me cool, refreshed and hydrated without the added junk. What do you like to sip on during the hot summer months? It looks very beautiful. it attracts me lot. I also can try this recipe..
Looks lovely and the straws are uber cute :) I'd ad lemon in it too, though and mash the strawberries. Hooray for the summer tomatoes and for Jason being the deckmaster! I did mash up my berries after I took the photos so I could get more strawberry flavor with each sip. I didn't think of adding lemon, but love the idea! Will definitely try it with my next batch! I love fruit infused drinks like this. They are perfect for summer cookouts! Oh, I am definitely making this. This would be so wonderfully refreshing on a hot, Georgia day. I'm obsessed with fruit infused water. Thanks for sharing this yummy recipe. I can't wait to try it! This definitely sounds like a drink I could get into big time! I am not sure about the ginger root but am willing to give ot a try. This looks really good. What a great drink for a hot summer afternoon. What a beautiful drink! This would be gorgeous at a summer patio party! Oh my,this would be soooo refreshing on a hot day. That honey would add such a nice touch! Wow... that sounds like a drink I would love! Now to figure out a container to make it in and have in the fridge is the tough problem. This looks good! I've been drinking lemon and limeade. I don't add sugar though - Stevia. It does look nice. I've been stirring honey into my tea now as well, is there anything this stuff can't do? Ohhhhh that sounds so good. I would have never thought about adding ginger to that....vodka maybe, but not the ginger! Cheers! This drink looks so refreshing and I would love to make this and have and drink outside on the patio. It is easy to make and strawberries make this drink look so pretty! Wow, this is a great, natural drink idea! Love it! These look so refreshing! Perfect for hot summer days and nights! Oh, that looks so yummy!!! I love how pretty it looks too, so it'd be perfect to serve at our summer family get togethers! This looks delicious! I bet the honey is great! Your pictures are beautiful! Such a great recipe. Perfect for a hot summer day!! It sounds like you are delightfully busy! I have dying bushes too. I want to get rid of them but hubs' says we have to try to revive them because they are our privacy bushes. Your drink looks great, I'm loving all of the strawberries in there. You can't beat a natural refreshing drink like this! It looks really tasty! I want one now! This sounds so good. I bet it really is refreshing during the hot summer months! This looks like a tasty way to stay hydrated during the summer months. Any reason to have more honey is a good one! I would have never thought of a beverage quite like this. With the hot sumer months already here it seems, I might mix up a batch of this sooner than you might think! This looks like a delightful drink. I don't have ginger root on hand though, so I'd need to pick that up. We spend a lot of time outdoors with our neighbors during the warmer months. This would be a great drink to serve everyone. That does look good. Very refreshing. I totally want a strawberry cooler now! I think I'll definitely be making some Memorial Day weekend! Honey and strawberries go so well together! Such a refreshing treat! I just got a bunch of strawberries at the store. I'll have to try this! I wish it was warm enough so I could try it. It looks just perfect for a hot summer's day! I love strawberries! This coolers look great I love adding the honey! This is an interesting sounding drink. I have put ginger in quite a few of my drinks because of all the health benefits. I've never had it with strawberry and honey. This looks like an absolutely wonderful drink for me for the summer. The photos are lovely too. Your strawberry coolers sound do refreshing! I have a bunch of strawberries in the fridge right now, I need to make this! Thanks for sharing the recipe..it's so true that many drinks outside are packed with sugar..so better make one..